We Didn’t Come Over on the Mayflower! The ignorance of our history has cast some of our “paesani” into the hinterlands of bigotry and prejudice, and thus led them to their coincidental and shameful consequences of non-acceptance of those who are not like us! I can arrive at no other conclusion as I offer up the three incidents below. This is in reference to a company that practiced “steering black and Hispanic borrowers to subprime loans while similarly qualified white borrowers got better terms.” This from a company whose CEO is descended from Italians who suffered indignities at the turn of the twentieth century analogous to those that Blacks and Hispanics have and continue to suffer. Between this, Capt. Schettino of the Costa Concordia, the East Haven (CT) Mayor’s reference to his seeming predilection toward “tacos,” and some of our antisemitic paesani, it has not been a good week for Italians/Italian Americans. Po’eri noi! While I find all of the above despicable, I am further disturbed by the anonymous letter I received this morning, on the eve of the “Giorno della Memoria” (Day of Remembrance), from someone, given its postmark, from my home town, someone, we might also presume from its closing, is, at the very least, of Italian descent. The West Side of Stamford, Connecticut was the working-class Italian section of town where I lived through 1973, when I left a high-school teaching position in order to pursue a Ph.D. in Italian. Stamford was where many Italian immigrants settled, be they the ones “right off the boat,” be they the others who moved to Connecticut in order to escape having to pay the “pizzo” in New York City because, as in one instance, they had a dress shop and were visited regularly by the local racketeers. That there were epithets thrown about over the years, especially in Italian, this, one cannot deny. But what I can state from my own experience is that there were never any fundamentally inhuman articulations of hate, as this cowardly anonymous letter expresses. Such hate is born out of fear and ignorance of the “other,” as most of us know. That anyone from our Italian/American community (for I can only assume this person is Italian) to engage in such hateful bigotry and prejudice only underscores how absolutely ignorant this person is of his/her history. 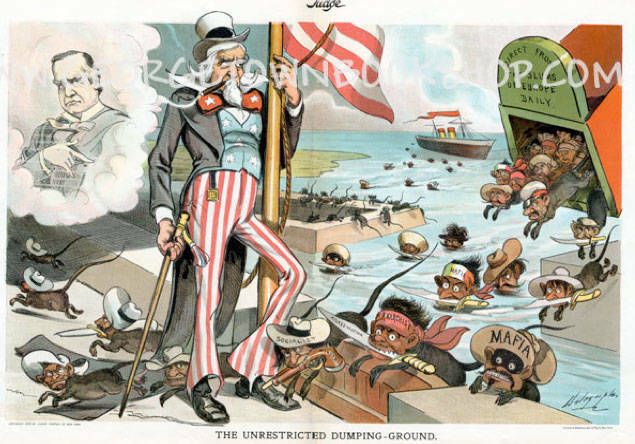 Italians themselves at the turn of the twentieth century were treated in a most dehumanized manner, as the Judge magazine cartoon here attached illustrates. In US cinema, one of the first images, if not the first, of the Italian was a small-town crook by the name of “Dago Pete” flashed in big letters on the silver screen. Further still during this period, Italians inhabited the lowest rung on the social latter, being paid the lowest salary among immigrants and members of other ethnic groups. All this to say that a greater knowledge—indeed any knowledge at all—might very well make us more understanding of the plight of the more recent as well as current groups of people who are now undergoing their own trials and tribulations with bigotry and racism, be it here (e.g., in the form of residue bigotry vis-à-vis the Jews) or in Italy, where current immigration issues continue to challenge the Italians in this regard. We surely should pause and take a good look in the mirror before we engage in that age-old critical act of denigration and dismissal. I have indeed underscored in various venues the need for a more profound discussion of the issues at hand; one that allows for dialogue and debate. Instead, it seems ever more present the tendency toward an outright facile discharge of other people’s arguments when, on the other hand, we might all better benefit from a more in-depth analysis of the issues at hand. Instead, it seems we often fall into that ready-made, all too fallibly human defense of the “us-against-them” when, once more on the other hand, it should be the “us-and-them,” seeking out the commonalities, historical and/or current, that bind us. Only in this manner, by ridding ourselves of those obscuring, and at times obdurate, “pre-judices,” as labeled within the philosophical realm, will we create greater and more productive synergy. In a similar fashion, we should not back down from re-considering past praise we may have lavished on someone to then find out that s/he indeed was not the individual we thought s/he was. The same is equally valid for those whom we, or others, might have misjudged and thus placed them in category of infamy. In either case, we should have the ethical rectitude to admit our initial misreading and offer up a re-constituted interpretation. Now, what is wrong with this situation, in addition to the blatant bigotry/racism involved? This was done under the leadership of an Italian American who, we might readily assume, worked his way up the ladder, pulled himself by his bootstraps. Yet, as the CEO of Countrywide, an obvious deduction may be that it was okay for him for such a policy to exist. Is it possible that he did not know of the policy? Who knows? I would remain somewhat incredulous at hearing such a statement articulated in such a categorical manner. Surprising, to boot, is the clamorous silence from the Italian/American community; for if we complain about what we consider to be nefarious acts that others do to us, we surely need to complain about those opprobrious acts our own may perpetrate on others. Well, the “we” of this editorial may be “una brava gente”; we just can’t tell in what way they are so “brava” of a “gente”—unless, of course, we are looking at how one can succeed in the re-writing of history and its coincidental devaluation of a people, each of which—I can only assume according to the articulated thought process of said organization—this officer and his ilk wish to propagate. Now, at the outset I said there were three horridly problematic issues of bigotry and racism. Well, there is an inevitable, consequential fourth. Given the tragic history of the Italian experience in the United States, especially from approximately the 1870s to the 1940s, how can any Italian American engage in any of the behavioral patterns described above, if ever so briefly? How can an Italian American, whose grandparents and great-grandparents were regularly characterized as non-white, indiscriminately allow his company to exploit financially other minorities? How can an officer of an organization that rationalizes its existence as a platform in order to promote Italian language, culture, and history desecrate so viscerally, I would submit, the tragic history—even in spite of the many individuals who did indeed save Jews in Italy—of the Jewish experience under Fascism? How does an Italian American send such a despicably racially charged letter without even identifying who he is?